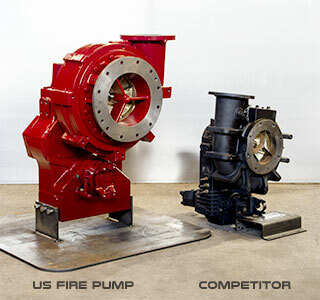 The USFP High Velocity Pump (HVP) is an engine driven fire pump designed to meet NFPA 1901 performances up to 6,250 GPM from draft and more. With sufficient engine power and a pressurized water system, performance will exceed 10,000 GPM. 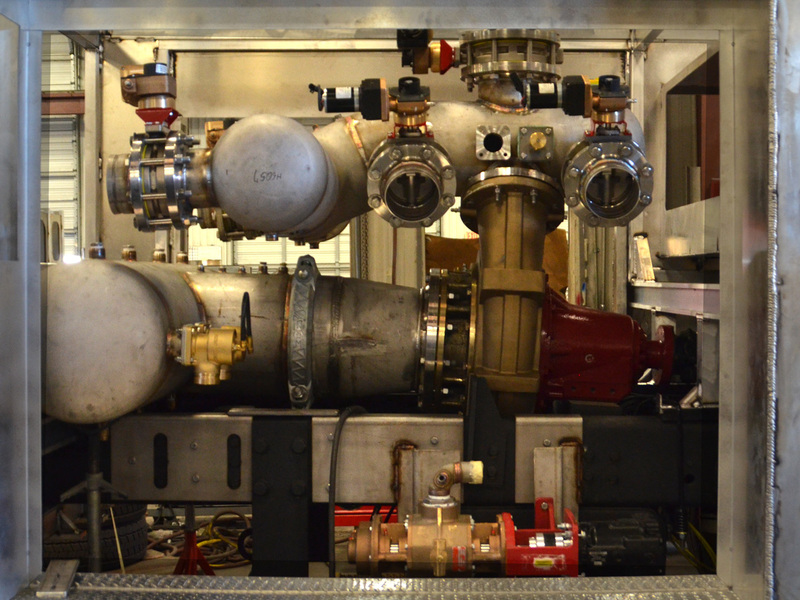 The key to this fire pump design is optimized flow through layout, which maximizes the pumps performance from pressurized water systems with capabilities of over 10,000 GPM. 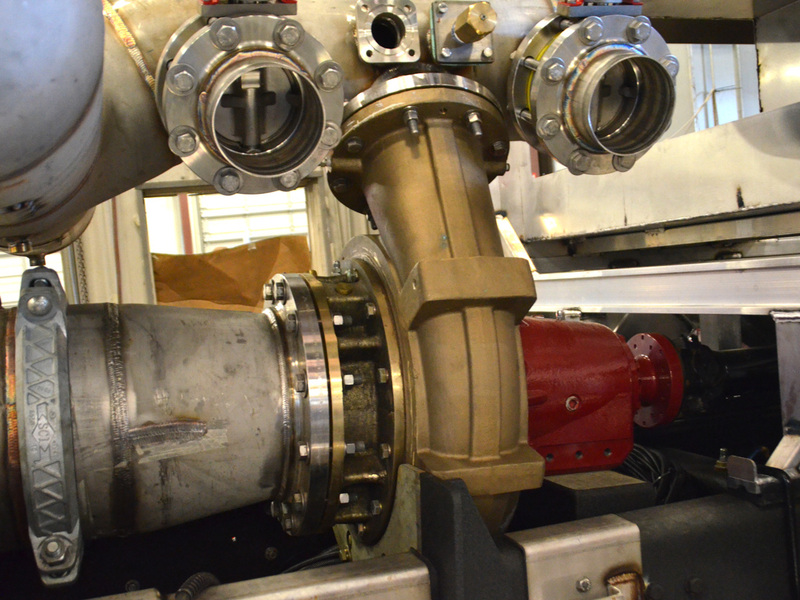 Part of this high flow design includes a 12” flanged suction inlet feeding an impeller eye, which exceeds 10" in diameter with a discharge outlet of 8” for the 5,500 GPM unit and 10" for the 6,250 GPM unit. 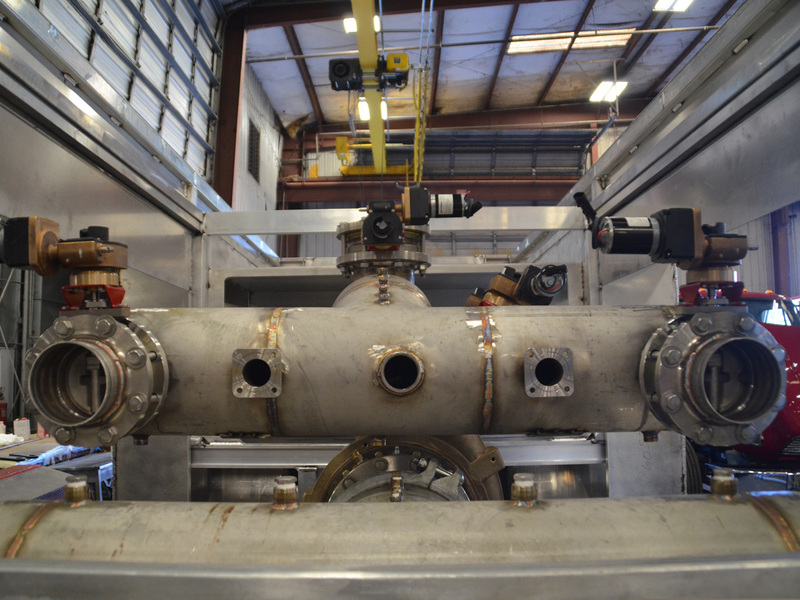 An important option designed into this pump is an auxiliary drive output to power SAE C/D hydraulic systems used to drive large foam systems or a flanged output to drive air compressors. 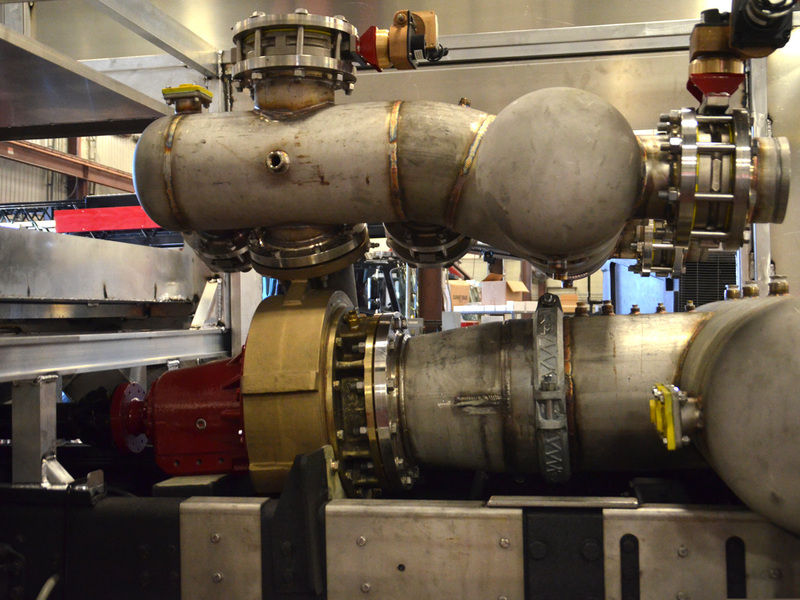 Additional design features include optional bronze pump construction, Teflon ring mechanical seal backup, and quite helical gear transmission. Impeller - Bronze mixed flow single suction impeller with a closed shroud design with front and rear wear hubs. Wear Rings - Front and rear replaceable bronze wear rings. Pump Shaft - Single piece design made of 17-4PH heat treated stainless steel. Shaft is rigidly supported by a matched set of tapered roller bearings on one end and a roller bearing on the other end. Seal System - Maintenance free self-adjusting mechanical seal with stainless steel spring and hardware is provided. Seal will have Viton cup and bellows seal, carbon rotating element and a tungsten carbide seat. A Teflon backup-sealing ring is supplied. Volute - Single cut water, vertically split design, cast iron volute designed to be flippable to change rotation. 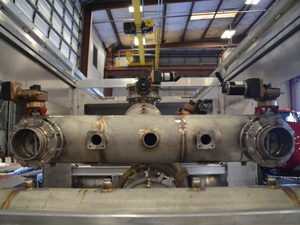 Volute can be rotated on the 12 bolt connection in 30-degree increments. Volute Connections - Suction intake 12” ASA flange size and discharge is an 8” ASA flange for the 5500 GPM unit and a 10" ASA flange for the 6000 GPM unit. Inboard Head - Cast iron housing holding rear wear ring and mechanical seal seat and cup. Outboard Head - Cast iron housing with 12” ASA intake flange connection, built in stabilized bushing bullet housing and pre-rotation baffles. Head also has ¾” FNPT top primer tapes positioned for optimum priming. Gear Case- - The case, top cap, end cover and tail shaft housing are made of 30,000psi fine grain cast iron. Mounting points will be provided on the top of the cap and on both lower sides of the main case. Bell Housing Adapter - Designed to accommodate SAE 1 engine bell housings. Bearings - Pump shaft is supported by a matched set of tapered roller bearings on one end and a roller bearing on the other end. The idler gear is supported by a matched set of tapered roller bearings. The lower drive has a matched set of tapered roller bearings and cage roller bearings support it. Gears - The gears are class 11, 20 degree helical 6DP gears made of heat treated 8620 steel. 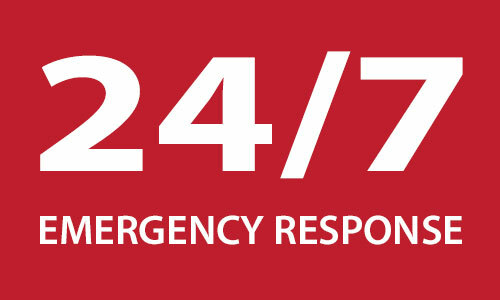 With ratios available are 1:1, 1:1.26 or 1:1.51. The pinion is carried in an eccentric housing, which allows changing ratios with out replacing the main gearbox casing. Oil Seals - Main drive, along with the top output, will have double lip oil seals. Drive Shafts - The lower drive shaft is made of heat treated 8620-alloy steel and designed to accept a engine matching elastomeric drive coupling disc.